It is difficult to think of a more emotionally charged issue to address than Hong Kong’s relationship to China and the rise of Localism, a movement that opposes mainland Chinese influence in Hong Kong. It is particularly difficult to find a good place to begin. Perhaps as good a starting point as any is to acknowledge some hard truths about Hong Kong’s relationship with the mainland. The city relies on the mainland for much of its food, water, and natural resources. The vast majority of the local population is ethnically Han Chinese—many of them descended from mainland migrants, if not are migrants themselves. And for decades, Hong Kong’s fate has been linked—seldom in predictable ways and not always for the better—with developments further north. It would also be fair to acknowledge that the current tensions between Hong Kong and the mainland are the latest in a long-running ebb and flow. Hong Kong has frequently been defined less by what it was, than by what it wasn’t. For investors and migrants alike, the overwhelming draw of Hong Kong was that it wasn’t mainland China. In recent years, though, that characteristic has changed, and, with it, outside perceptions of Hong Kong’s relative advantages to the mainland. And, as the flow of people and capital into Hong Kong from the mainland has intensified, the latest wave of tourists and immigrants seems, to some, to also bring with it the arrogance that often accompanies visitors from countries in the ascendant. As a Hong Konger, I understand—to a degree—the visceral appeal of Localism. It is difficult to identify the core political or philosophical tenets of Localism with any certainty, beyond (a) a staunch rejection of mainland China and its denizens, (b) a virulent hatred of pan-Democrats and other political opponents it brands as pro-Communist “leftards,” and (c) a penchant for direct action, such as harassment of mainland shoppers and stores that cater to them. Even observing events from a distance, it was difficult for me not to be dismayed by scenes of physical altercations in Sheung Shui and Yuen Long, in the New Territories—frequently led by “Localists” coming from outside the area. The tone of these incidents, in particular, seemed markedly different from what I, and others, observed throughout the Umbrella Movement: an almost nihilistic rage replacing what was, if not optimism that the movement would succeed, then at least a sense of decency in defeat. As a Hong Konger, I understand—to a degree—the visceral appeal of Localism. As mainland visitors come in ever-increasing numbers, entire neighbourhoods have been reshaped by economic and food safety imperatives that are not our own. Throngs of tourists have made already packed districts and attractions feel even more congested. And tales of instances of rudeness by mainland visitors spread rapidly, both online and offline. A sense that Hong Kong can no longer accommodate its own, and the resentment that comes with it, would not be surprising at all. Localists also often take up the cause of linguistic and cultural preservation—insisting on the Cantonese dialect and traditional Chinese characters. But brandishing the local tongue as a shibboleth and forcing others to “pick a side”—tactics employed by the Localists—are not, intuitively, a good solution. Nor is the notion that Hong Kong can somehow completely cut itself off from the mainland. Walking through one of the city’s many malls, it felt as if Occupy had merely been a collective fever dream. Ultimately, Localism represents merely one response to a troubling question: how should Hong Kong carve out, and preserve, a distinct identity within China? The Localists are correct to say that it is a pressing question. But they seem much less interested in offering answers. On my second full day back in Hong Kong, it seems difficult to imagine that the city was in the throes of the Umbrella Movement during my visit last year. The signs are still in traditional Chinese characters. Cantonese is still, by far, the predominant dialect. Walking through one of the city’s many malls, it felt as if Occupy had merely been a collective fever dream. Yet there are a few tell-tale signs that something is amiss. A listing in the Cathay Pacific duty-free catalogue for mooncakes by Maxim’s—a local catering conglomerate—referred to the company not by its English name but by the Mandarin pinyin “Mei Xin.” The city declared an ad hoc holiday on September 3, coinciding with China’s display of military might in Beijing to mark the 70th anniversary of the official Japanese surrender at the end of the Second World War. And the football match that night, between Hong Kong and China, took place amidst unusually high security and attention from the Hong Kong media. A week into my return to Hong Kong, the fault lines have become easier to see. My local mall in Shatin continues to teem with suitcases from the North, at one point blocking the passage outside a cosmetics store. The fallout from allegations that a Chinese footballer referred to the Hong Kong goalkeeper as a “dog” swirled for days in the print and broadcast media. And Localist protests resurfaced in Sheung Shui on the 6th, after six months of inactivity. Evidence of the Umbrella Movement seems much harder to come by. The junctions in Admiralty, near Central, and Mongkok, in Kowloon, that were the core occupied zones now hum with traffic. Outside the Hong Kong University Students’ Union, a handful of posters demanding universal suffrage appear not to have been read, or disturbed, for some time. Some of the key figures in the Umbrella Movement do not even plan to be in Hong Kong at the end of the month, the first anniversary of the protests. The past several weeks have been a blur of lesson planning, and conversations with friends, relatives, and mentors. It was during one of these conversations that it struck me: a sense of propriety was missing. It is the spread of Mainland values—borne by new arrivals and increasingly found among “natives”—that lies at the heart of the wave of popular revulsion. The sense that Hong Kong had somehow been knocked out of kilter blazed from the increasingly outrageous public statements by mainland cadres and academics purporting to know more about the Basic Law than Hong Kong’s judges. It fed the public furor over subway staff turning a blind eye to parallel traders with oversized bags while giving a hard time to schoolchildren carrying musical instruments. But it also oozed from Localist guru Chin Wan’s bizarre warning that a democratic China would raid Hong Kong for comfort women. And it sprang from the mouth of Localist bigwig Cheng Chung-tai, who spoke without irony about seeking audience participation at an academic forum after barracking other participants and seizing the microphone from the hapless moderator. The problem, it seems, isn’t so much with an influx of people from the mainland. It is the spread of Mainland values—borne by new arrivals and increasingly found among “natives”—that lies at the heart of the wave of popular revulsion. Institutions that Hong Kongers thought sacrosanct are being undermined, or swept aside, if found to be politically inexpedient, such as allowing mainland public security officials to operate cross-border rail immigration checkpoints on Hong Kong soil—an act forbidden under the Basic Law. Ideas previously taken for granted, like judicial independence, are suddenly the subjects of fabricated controversy. Even the basic rules of public discourse are being thrown away, seemingly replaced by just one rule: the person with the biggest megaphone wins. The physical infrastructure of Hong Kong is still there. But the social infrastructure—the common ground among its inhabitants as to how to relate to one another—is shifting and crumbling beneath our feet. Back on the other side of the Pacific, I can finally begin to put what I saw this fall into some semblance of perspective. Even the basic rules of public discourse are being thrown away, seemingly replaced by just one rule: the person with the biggest megaphone wins. The past two months confirmed my intuitions of a city gone awry. The Hong Kong University Council’s refusal to appoint former law dean Johannes Chan to a senior administrative post due to his liberal political views was matched in absurdity only by the “reasoning” of figures keen to defend that rejection. And the continued impunity and delays in prosecuting the police officers allegedly involved in acts of brutality committed during the Umbrella Movement casts a growing shadow over Hong Kong’s vaunted rule of law. Yet even amidst the decay there seemed to be some signs of hope. “Umbrella soldiers”—first-time political candidates roused to action by the protests last year—won a surprisingly large number of seats in the District Council elections in November, unseating incumbents and giving a wake-up call to the city’s ageing democratic politicians. Although the protests resulted in a groundswell of support for the “Umbrella soldiers,” other, more “radical” candidates—including members of the Localist Civic Passion group—found little favor with the electorate. Yet even amidst the decay there seemed to be some signs of hope. I thought back, too, to one of my last days in Hong Kong, and to my conversation with a close friend over dinner. She had grown up near Shanghai, but had moved to Hong Kong first as an undergraduate and then to work. During her years in Hong Kong she learned Cantonese, began reading more widely, and eventually decided to acquire permanent residency—giving up a mainland hukou and choosing to make a home in Hong Kong. She had come to appreciate, she told me, values such as free expression that made Hong Kong distinct from the mainland, even though she also saw these values under threat. The Hong Kong I saw over the fall of 2015 continues to grapple with what it means to be a Hong Konger, and the question of who should represent the future of Hong Kong. If we are lucky, that standard-bearer will look much more like my dining companion than the Localists. Alvin Y.H. 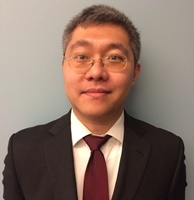 Cheung grew up and practiced law in Hong Kong before moving to the United States, where he is now based. HRIC asked him to keep a diary chronicling his time back in Hong Kong as a lecturer in Law & Public Affairs at Hong Kong Baptist University during the fall of 2015.